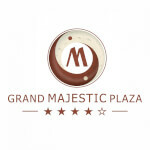 The Grand Majestic Plaza hotel is a very centrally located modern design 4* Superior category hotel with 196 rooms and meeting space up to 468 pax. The hotel is an ideal place for international mid size meetings for up to 140 pax in classroom style plus an additional 5 breakout rooms all equipped with built in latest AV technology, extensive lobby area with a water fountain area which is available for big receptions and exhibitions, many meeting rooms with natural light. Our conference rooms are furnished with hard wood floors and unique business very comfortable arm chairs will make the difference to your meetings. All this in the very down town of Prague. The hotel is situated next to the Republic Square with has the biggest down town shopping center called Palladium and another one called Kotva just on the other end of the square. Two most down town squares, Old Town and Wenceslas, are within 10 min walking distance from the hotel. The hotel sits on the edge of the down town pedestrian zone. Close by in 5 min walk are 3 shopping malls including the biggest and latest opened down town shopping center Palladium.